Great things start small: Our CLASSIC 5 not only is the decent entry into the audiophile world of AUDIO PHYSIC, but raises the standards of its class to a new level. In order to let it play up "big" acoustically, our R&D team has equipped the loudspeaker with intelligent technical refinements. Both drivers were specifically developed and designed for the CLASSIC 5. The powerful midwoofer has a cone made from woven glass fibre that combines low weight with high internal damping. Sound-disrupting partial oscillations of the cone are thereby effectively prevented. Both drive motor and suspension ensure rich bass performance and impeccable step response at the same time. The fixed phase plug reduces compression effects, which can lead to imperfections especially in the sensitive mid-range. In addition, heat generated during operation can more easily escape from the system, while the physical parameters remain the same even at higher volumes. The tweeter excels with a silk dome and a powerful drive motor. The slightly horn-like shape allows a sensitive adjustment of the sound radiation behaviour in the transition zone between mid and high frequencies. This way, the spatial image remains homogenous and threedimensional even somewhat outside the sweetspot. Another particular feature is the crossover’s intelligent architecture. Instead of using a classic printed circuit board, the CLASSIC 5 comes with a freely wired crossover with high-quality components such as film capacitors. In the well reknown tradition of AUDIO PHYSIC, the drivers of the CLASSIC 5 are housed in a solid and artfully crafted cabinet. 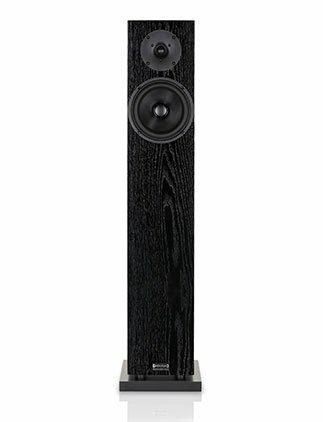 The oversized plinth gives the speaker a secure footing on any surface and makes the CLASSIC 5 look modern and elegant, no matter which version or real wood veneer you choose. Thanks to the integrated M8 threaded bushings to take the standard spikes, the CLASSIC 5 therefore also offers the possibility to be equipped with the optional high-quality AUDIO PHYSIC VCF II M8 feet. These Vibration Control Feet (VCF) decouple the speaker from the floor and lift the sonic performance to a noticeable higher level – and that not only on sensitive floors. Lend the CLASSIC 5 an open ear, and you will amazingly experience how big our “little ones” sound. Your specialist AUDIO PHYSIC retailer is looking forward to welcome you for a visit. Height 950 mm / 38.0"
Depth 230 mm / 9.1"